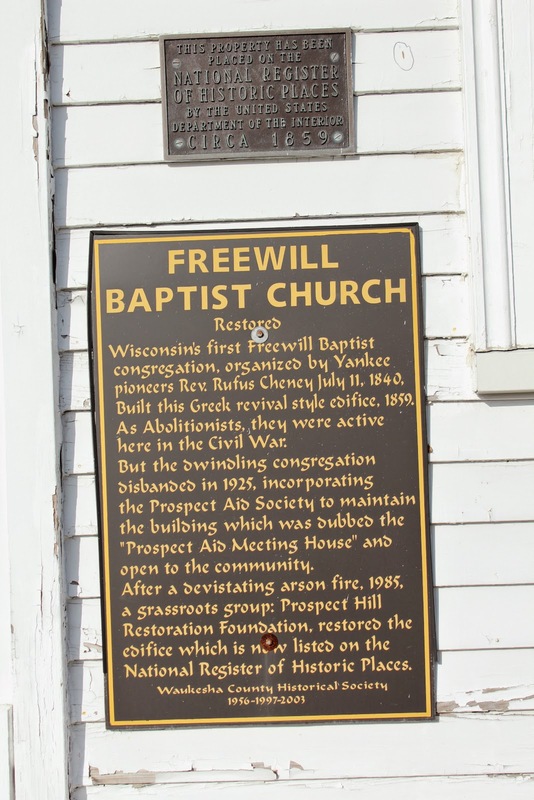 Wisconsin’s first Freewill Baptist congregation, organized by Yankee pioneers Rev. Rufus Cheney July 11, 1840, Built this Greek revival style edifice, 1859. 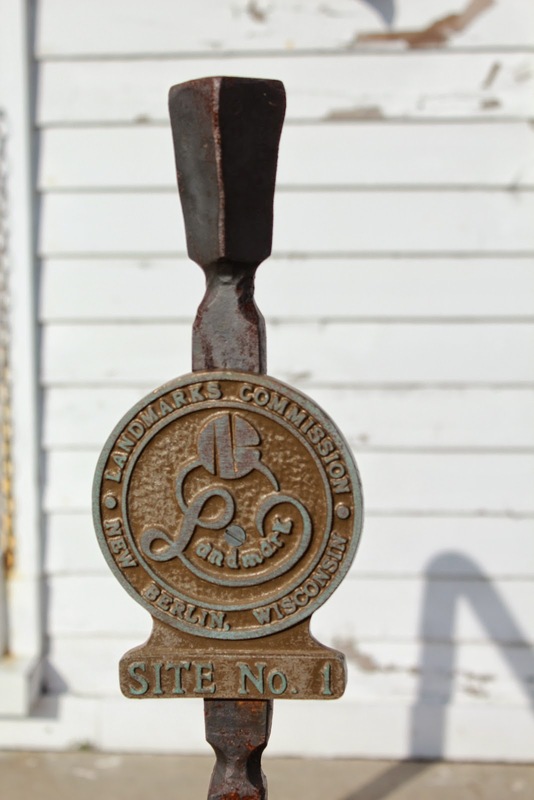 As Abolitionists, they were active here in the Civil War. But the dwindling congregation disbanded in 1925, incorporating into the Prospect Aid Society to maintain the building which was dubbed the “Prospect Aid Meeting House” and open to the community. 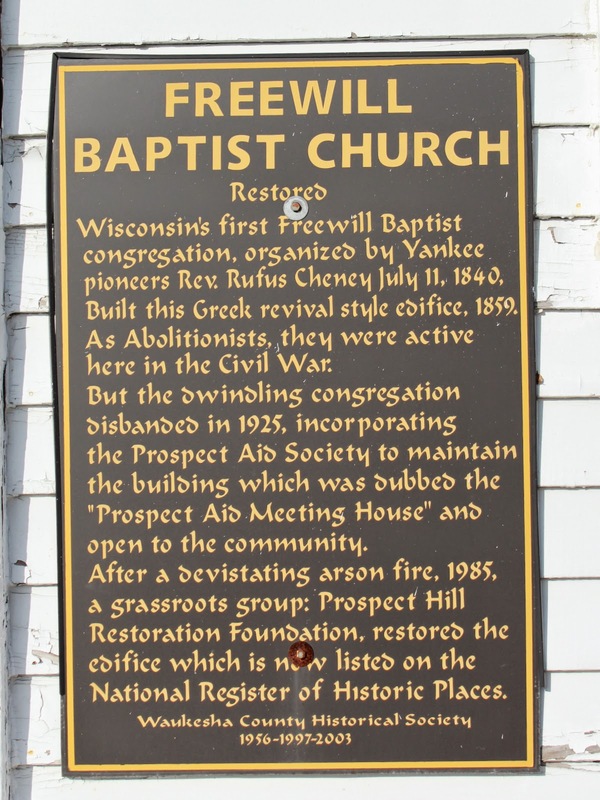 After a devastating arson fire, 1985, a grassroots group: Prospect Hill Restoration Foundation, restored the edifice which is now listed on the National Register of Historic Places. 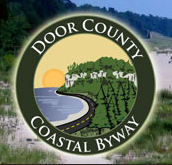 The church and marker are located on westbound West National Avenue / County Road ES, just west of its intersection with West Barton Road, at 19750 West National Avenue, New Berlin Wisconsin 53146. NOTE: There must have been some recent upgrades (within the past couple of years) to West National Avenue (a new route and a new bridge is my guess), because, even with the correct coordinates, my GPS had a very difficult time getting me to this location. In short, there is no longer an intersection of West National Avenue with South Racine Avenue. I finally used my intuition and was able to locate the church. This wonderful, moving article includes a history of the church, the 1985 arson fire and restoration. 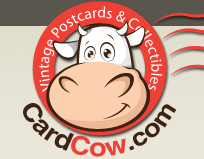 The property is listed on the National Register of Historic Places: Wisconsin: Waukesha County, and has also been designated a New Berlin City Landmark. See also, Cheney-Faulkner [sic] Cooper Home / built 1840, a related marker at a nearby location. The marker is No. 21-04 in a series of historical markers erected by the Waukesha County Historical Society. See also, Original Church Bell, also at this location. The church is located at the Prospect Hill Settlement Historic District. The Original Church Bell historical marker is also at this location. this beautiful and historic building!